The first track released from Beck's Morning Phase album, this lush acoustic rocker went online on January 20, 2014 ahead of the long player's release. The disc was billed as a successor to 2002's sparse Sea Change. Speaking to Rolling Stone, Beck described it as "California music," adding that when he makes any album, "I'm just fumbling around with chords and a mood. Hopefully something emerges." He continued, "The songs are coming out of a California tradition. I'm hearing the Byrds, Crosby Stills and Nash, Gram Parsons, Neil Young – the bigger idea of what that sound is to me." The song finds Beck looking for a little human connection as he sings of "I'm so tired of being alone," and the "vagabond that no one sees." Beck previously compared himself to a vagabond on French duo Air's 2001 track "The Vagabond," on which he was a guest vocalist. There is an old Rodgers-Hart standard with the same title, which was originally written for the 1934 movie Manhattan Melodrama and has been recorded by Elvis Presley, Louis Armstrong and The Marcels amongst a whole slew of artists. Beck appropriated the song name but didn't include the title in the lyrics. The track also appeared in an episode of HBO's Girls and was included on the Girls Volume 2: All Adventurous Women Do… collection. This was inspired by Peter Guralnick's two-volume Elvis biography Last Train to Memphis and Careless Love. Beck told NPR's All Songs Considered hosts Bob Boilen and Robin Hilton: "I'd had it on my shelf for like 15 years and I finally read it about a couple years ago. I feel like every musician when they're starting out should just read that book." Beck added that the line "The lies you tried to hide behind your eyes" was influenced by the original "Blue Moon," which he feels encapsulates the purity that Elvis had at the beginning of his career. "When you read the book, you really get a sense of who he was at the beginning and then at the end," he explained. "You see him go through the entire cycle of, for lack of a better term, show business, until he's at the end in Vegas, ensconced in this hotel room, kind of remote and separated from the world and life. But when he's younger, he's just so accessible. He lived with his parents and after dinner would go and sit with his fans who'd all be waiting outside — they were allowed to wait. I don't know, that's what I was thinking about with it." 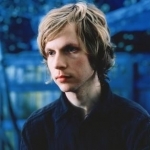 Beck has generally veered towards ambiguity in his lyrics, and a typical pattern can be observed in this song. The opening line - "I'm so tired of being alone" - sets out a theme, which he proceeds to apparently ignore instead turning to enigmatic imagery. "It makes it more interesting if there's a little bit of the elliptical happening," Beck commented to The Guardian of that particular habit. "Hopefully some of it translates. Perhaps it won't literally translate from the lyrics but somehow from the feel of the music. Even in the music, it's iffy you know, but it's a good attempt." This song barely made it onto the album. Beck recalled to NME: "That was a demo I'd forgotten about and put on the shelf, and at the very last minute of finishing Morning Phase, I stumbled on it and we said 'Let's put this on the record too.'"